"Zillion Enterprises", is established in the year 2006 in Tamil Nadu, India. We are basically a sole proprietorship based company. Zillion Enterprises is engaged in manufacturing, supplying, wholesaling and trading of Electronic Products. Our offered products are Servo Stabilizer, Solar System and Electronic UPS and many more. The products offered by us are known for their hassle free performance and longer shelf life. These products are available in market in different sizes and specifications. Further, our products are of international standard and available in market in bulk at industrial leading prices. To manufacture these products, we have hired talented team of professionals who have wide knowledge in their concern domain. Moreover, we have maintained a reckoned position in the market in short period of time by providing unmatchable quality products to the customers and satisfy their entire requirements in all manners. We are client centric organizations offering wide range of quality products in the market. In addition to this, we offer excellent Water Softening Services and Iron Removal Services to our valuable customers. We seek to maintain close relationships with our customers as well as other organizations and vendors to ensure supply of quality compiled products. To maintain this, we have hired and assembled a team of talented, experienced and efficient professionals who assists us in all our activities. They work in coordination and passion with our vendors to devise innovative distribution and promotion strategies while continuously improving our products. Their dedication to work as a team enables us to ensure that our customers are rewarded with value added services. Today, we have attained a commendable position in the market in short period of time. All this became possible with the support of "Mr. J. Gowthaman". He is the owner of Zillion Enterprises and he manages the entire business with his skills. He has wide knowledge and years of experience in his domain. Further, he works on some business principles and ethics for the growth and success of the company. He always motivates and encourages our professionals in all manners to give their 100%. Under his guidance, we are able to maintain a fruitful relationship with our customers. We are appreciated among our valued clients due to our good quality products. Impeccable infrastructure is the hallmark of our company. We are backed by sophisticated infrastructure that consist machines, built on the latest technology and equipment. The advanced machines help us in manufacturing quality products in bulk and giving a desired range of output, without any compromise on quality. We upgrade our infrastructure timely as per the requirements with advance technology. Our sensitivity towards the quality gives us unique insight in the needs of market. To ensure quality of the products at all levels, we have appointed experienced quality controllers team who manage quality from end-to-end. Owing to all these features, the entire products range has been confirmed to be in compliance with the standards quality. We ensure to provide unmatchable quality products to the customers at most reasonable prices. 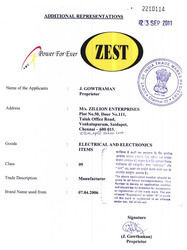 We offer our products under the trademark of Zest. To manufactured quality products, we are empowered with experience and reputed vendor base. Our vendors are known for using optimum quality material and tested the products from their quality in various parameters under the supervision of quality controllers. We select our vendors on their working experience, knowledge, talent and relationship in the market.